I think anyone who saw Foals at one of their NYC shows last fall (especially the nutso one Music Hall of Williamsburg) could’ve predicted, as I did, that next time through town they’d be at Terminal 5. 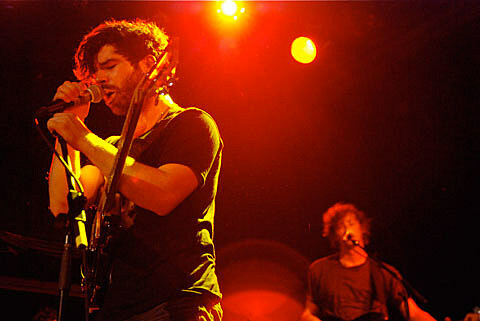 And lo, it’s happening: Foals will play Terminal 5 on May 4. Tickets go on sale Friday (1/21) at noon. What you might not have guessed is that this upcoming tour, which the Terminal 5 show is part of, Foals would be playing with those purveyors of winsome folk pop, Freelance Whales. What?! Sure, Foals — who made my #1 album of 2010 — have a more mainstream audience now, and there are probably people out there who really like both bands…but this is one of the odder tour pairings to come along in some time. Will Freelance Whales fans stick around for the stage-diving and crowd-surfing that comes with Foals shows these days? Will Foals fans behave during the Freelance Whales set? Is this the state of touring in 2011? These and other questions will be answered in April when the tour starts. Also along for the ride for most of the North American dates are Australian dance-pop group The Naked and Famous. The “Deluxe Version” of 2010’s Total Life Forever which dropped in the tail end of last year features a whopping 44 tracks and 5 videos via iTunes UK (only) and not only includes the album tracks, but also demos, remixes, b-sides, and videos from the record. No word on when/if the Deluxe Version will hit our shores, but until then you can checkout the tracklisting and all dates below.